Here’s the second Tweetinar! It’s more than 320social media insightful tweets! On March 10th I launched my second Tweetinar, “Social Media – The BIG Picture” based on Part Three of my book. This “Tweetinar” delivered social media insights three times a day, five days a week at 10:00 AM, 12:00 PM, and 2:00 PM, Monday through Friday, and runs all the way through SEPTEMBER! If you missed any of my first Tweetinar I will share those social media insights with you in each of two, bloginars. The second 60+ social media insights are below. Be sure to RSS this blog or check back soon for the final 60 tweets to complete your Five Steps To Social Media Success bloginar. Also remember to follow my tweets for more social media insights and the biggest Tweetinar yet! • Conversion might be getting someone to open an email and click to a website. It might mean sign up for your email. 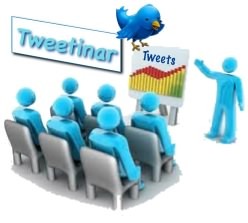 • Conversion could mean getting more Twitter followers or simply band awareness. • Conversion could mean your display ad will get them to call an 800 number. • Nearly all definitions of “conversion” sooner or later lead to sales. • Next look at who’s doing it; is it “in-house” or “outhouse”? • If in-house, look at maybe your time is better spent doing other things besides marketing. • If out-house, be very sure that your marketing company really understands social media marketing. Many don’t! • Next look at what is your existing strategy for each campaign. • What’s your message, your frequency, your style, your persona, and your call to action? • Too frequent, they will unsubscribe, wrong style, they won’t listen, wrong persona, you won’t connect. • If your call to action is too weak or missing, then you wasted your time! • If you don’t touch your prospects enough, they will forget who you are and you will loose brand recognition. • What’s your style, persona? What personality do you use for communication and is it right for that demographic? • You speak differently at work, out with your friends, to your kids, to your parents, and your customers. • People don’t buy from big corporations. People buy from people. • People buy from people they trust. • Have you ever bought a car from someone you didn’t like? Didn’t trust? • Remember: Always be Authentic, Sincere, & Transparent! • If you aren’t transparent, your followers will see right through you! • Following Step 1 forces you to look closely at your business so you will see what’s working and what’s not. • Analyze your demographic(s), not your demographic. Look at your micro-demographics. • Sure, your demographic is 35 to 55 years old, combined income over $100k, college degree, 2.3 kids. • Break down your demographics. A 35 yo is significantly different than a 55 yo. • A 35 yo is trying to get that next promotion, stopping for cough syrup on the way home, getting the kids to bed. • A 55 yo is an empty nester, at the top of their career, maximum income, more personal time. • What are your micro-demographics “hot buttons”? What motivates a 35 yo is different at 55. • How does each micro-demographic prefer communication, 25 Facebook, 35 text, 45 email, 55 telephone? • You need to address every micro-demographic in an effective persona and in their choice of technology. • Get into every micro-demographics head to understand their lifestyles. • When does each surf the web, when do they open their email, when are they on Facebook, when can they talk on the phone? • Does each micro-demographic read the newspaper, look at email, read your tweets, go to trade shows? • Understanding your micro-demographics means better psychological hot buttons, effect communication, high conversion. • Keep your existing customers so they can buy more. It’s an easier sale. • Reselling to your existing customers significantly reduces your COCA or Cost Of Customer Acquisition. • Your goal is to “convert” prospects to customers to gain sales and reduce your COCA. • Remember: Existing customers and prospects are two completely different mindsets. Thank about that. • Your customers and prospects are using different technology to connect with you. • Customers are continuing your relations maybe through blogs and tweets. • Your prospects are studying you through web search and Facebook peer reviews. • Understand how your micro-demographics will be shifting, from newspaper to on-line, from television to Hulu. • Step 2: The Trinity of Social Media; blogging, micro-blogging, and social networks. • Part 1 of the Trinity is blogging. • Understand the Five ‘W’s of each. Who, what, where, when, why, & how. • Seriously, answer the Five “W”s for each, in detail. Start with blogging. • You need to know what a post, a comment, a more, tags, plug-ins, widgets, etc. • You need to decide whether to use a blogging site like Blogger.com or Typepad or host it yourself with WordPress orJoomla. • There are a lot of advantages to NOT use someone else’s blog site. • There are a lot of advantages to using WOrdPress on your own site. • By using WordPress on your own site you gain a lot of SEO (Search Engine Optimization) advantages. • Use WordPress on your site an benefit from “Google Juice”, “Link Love”, and “Freshness”. • Google Juice is how many links to web & blog pages has Google indexed for your site and keywords. • The more indexed pages of yours Google has for your keywords the more likely you will be listed in the top 10. • If you’re not on the first SERP (Search ENgine Result Pages), and above the fold, you’re not in the game. • Blogging creates many pages that contain your category of keywords. • You want to own your industry’s keyword on Google. THis applies to all of the search engines. • Then there’s Link Love. This is where people are linking back to your blog. • Link Love or External Reputable Links is one of the top three criteria Google uses to rate your web site. • The more links you have coming from site & blogs that use your same keywords, the higher Page Rank you will get. • The more pages and the higher the Page Rank, the higher you will appear on the SERPS. • Be sure to add links to other’s blogs to drive them up in the listings, which will drive you up too. • Participate Comment Marketing. Where you continuously comment on other’s blogs. • Participate in your industry’s conversations. You have to be IN the game to WIN the game. • Google also considers blogs to be significantly more “fresh” than html web pages. • Which IS more fresh, the blog you wrote Friday or your home page that hasn’t been updated since 2008?